Mechanical Seals, Third Edition is a source of practical information on the design and use of mechanical seals. Topics range from design fundamentals and test rigs to leakage, wear, friction and power, reliability, and special designs. 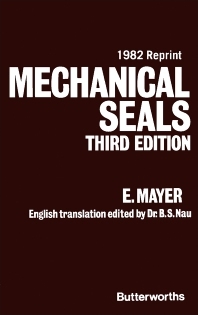 This text is comprised of nine chapters; the first of which gives a general overview of seals, including various types of seals and their applications. Attention then turns to the fundamentals of seal design, with emphasis on six requirements that must be considered: sealing effectiveness, length of life, reliability, power consumption, space requirements, and cost effectiveness. The next chapter is devoted to test rigs used to establish the effect of the various seal parameters on the behavior of face seals. Special test rigs used to establish leakage, wear, friction losses, and temperature distributions for various material combinations, rubbing speeds, pressures, fluid media, and temperatures are highlighted. The following chapters explain primary leakage through the seal gap between the faces of the seals; factors that contribute to seal wear; friction and power of a mechanical seal; relationship of leakage to wear and friction of a balanced face seal; and importance of seal reliability and operating safety. The final chapter explores particularly interesting sealing problems together with the use of special accessories such as heat exchangers; magnetic and cyclone separators; and techniques such as cooling and auxiliary circulation. This book will be useful to mechanical engineers as well as seal designers and seal users.